Hot Joints are a common problem to find in electrical connections on your trailer plugs and inside your caravans. A hot joint is an electrical connection that becomes loose over time or connected by only a few strands in the connector ferrule. A small cable like 23/.0076 has 23 strands of wire. Only eight stands of the cable may be under the screw and the balance inside the with no physical connection. Cables touching the ferrule may conduct electricity but are not connected. Once a load is applied these cables can spark full load, creating heat. An inspection of your 7 Pin Towbar Socket will likely identify a white powder around the male and female plug. This white powder is zinc oxide. Zinc Oxide is not a conductor of electricity. The Zinc oxide has when released from the zinc coating on your connector over time. There is no way to fix oxidation other than to replace the connectors. If not replaced, your trailer lighting will suffer intermittent failure, hot joints may appear and your brakes will suffer significant voltage. Before replacing the connectors make sure your brake cabling is 5 or 6mm to ensure 12v under load, at your magnet. There is more, later in this article about how to correctly install a trailer plug or socket. Most plugs are installed incorrectly. A few common sense procedures will ensure your connections last for as long as your own your rig. The electrical connection inside caravans is likely to be covered by Australian Standards 3001. My old electrical days tell me, Double Insulated 2.5mm cable is used for power and up to 1.5mm for lightning. Double pole switches are to be used on all power points and light switches. The cabling wire inside your caravan has thicker stands than that used in your trailer. Hot joints are not so common. It is still good to be aware of the connection procedure for all cabling in your rig as solar power is likely to be installed at some stage. Cut back the outer sheath so that it does not protrude outside the sheath cover. The cable must be inserted 100% into the back of the ferrule. Measure the cut on the cable cores. Take your time; this is not is a rush job. 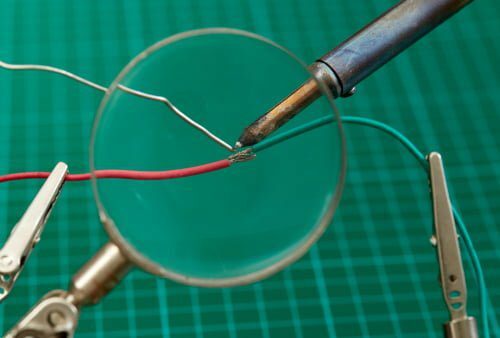 Twist the cores and then solder the cores together so a robust electrical bond exists. Clamp the sheath cover into position. Use long nose pliers to neatly place the cable into the cable ferrule. Lock the terminal screw onto the soldered joint. 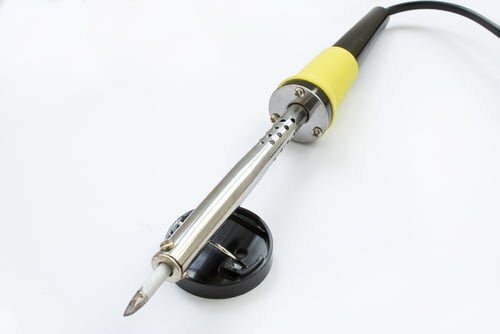 Questions, why is a soldered joint better than a screwed connection on bare cable. In a few words, vibration fatigue. Read more about vibration fatigue here. Cabling in Aircraft and other equipment exposed to extreme vibration fatigue is soldered, inserted into a spade or connector then crimped. This procedure greatly prevents hot joints. In my opinion, a caravan on an Outback dirt road experiences more vibration than a Military Combat F15 flying missions in Syria. Al-ko outback rebound springs are made for such conditions. A boat trailer will experience as much salt as trawlers on the TV series, the Deadliest Catch. Electrical joints that are not soldered are guaranteed to fail at some point. Failure will either be via corrosion, oxidation, hot joint or fire. If like me, you rushed the electrical connections on your trailer, caravan or boat trailer. Take an hour out of your time and do it correctly. Is an ounce of prevention worth a ton of cure? Absolutely! In conclusion, soldered electrical joints ensures a 100% effective electrical system.